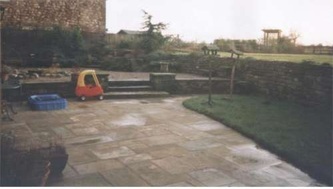 York stone flagging provides level clean surfaces for a play area. The stone steps are flanked by low mortared stone walls and lead up to another York stone flagged patio area. 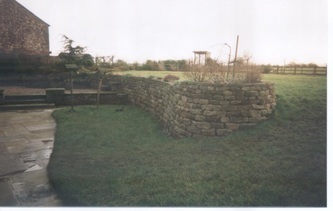 A drystone wall provides a backdrop and the curved endpiece provides a planting area.